WHEN I LIVED AND WORKED in Sleepy Eye for six months in the early 1980s, I didn’t fully appreciate this southwestern Minnesota community. Mostly, I was too busy laboring away at my more than full-time job as a newspaper reporter and photographer for The Sleepy Eye Herald-Dispatch. Anyone who’s ever worked as a community journalist understands that the profession demands much time, energy and an endless skill set. Basically, I didn’t have a life outside of work. Now that I’m much older and long ago realized that life should be about more than a profession, I realize what I missed. I may have covered the people, places and events of Sleepy Eye well. But I didn’t really notice. I didn’t take time to personally value sense of place. 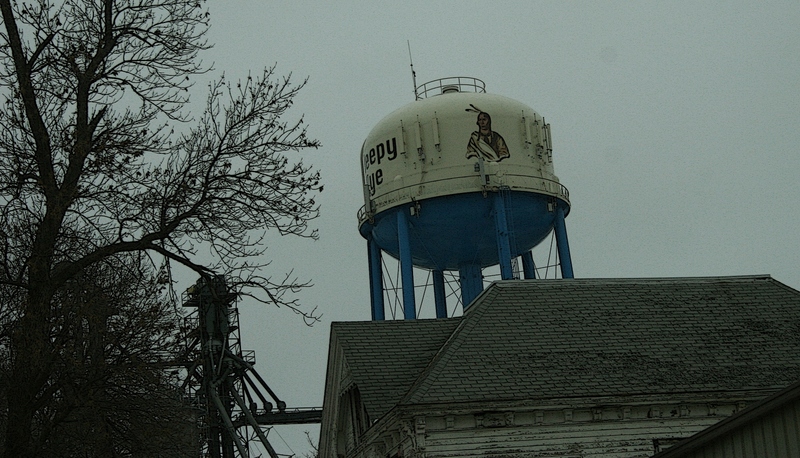 A passing shot shows Chief Sleepy Eye’s image painted on the water tower. Like most small towns, Sleepy Eye possesses unique characteristics, most notably its name. The community is named after Sleepy Eye, a long ago chief of the Lower Sisseton Dakota. You’ll spot his image on the water tower, on the town’s welcome sign, on the public school website (the school mascot remains the Indians) and probably additional places. Sleepy Eye seems to take positive historical pride in its name. And it should. On my last pass through Sleepy Eye en route to my hometown area further to the west, I noticed a painting of Chief Sleepy Eye on the side of a downtown building. The sign was strategically placed by a stoplight. So I snapped a quick frame while waiting for the light to turn green. Later, studying the details of that image and after some Googling, I learned that Ish Tak Ha Ba is Chief Sleepy Eye’s name in his native Dakota tongue. And I discovered that an Old Sleepy Eye Collectors Club exists, focused on preserving Sleepy Eye antiques, memorabilia and collectibles. One of these times traveling through Sleepy Eye, I am going to stop and explore. And this time I will really see the place I once called home. See and appreciate. IF YOU KNOW SLEEPY EYE well, what are some must-sees there? Remember, I’m always seeking out the lesser-known, the unusual, the treasures. Wherever you live, tell me what you would like visitors to see in your community. How is the town doing? Is it thriving or becoming yet another prairie ghost town? Speaking of ghost towns, the Freeborn County Historical Society has a display on abandoned towns. There are a couple within a few miles of our place like Moscow and Newry. Both of these towns were centered around a cross-roads store, others were built around a creamery. It is interesting to poke around them. It gives you a glimpse of what life was like before good roads and comfortable cars. I can’t answer your question about how Sleepy Eye is doing. Perhaps a reader can. That Freeborn County Historical Society display on ghost towns sounds interesting. May be time for a day trip south to explore the area more. Funny that you ask what you would like visitors to see in our own communities. The North Iowa Bloggers have hooked up with Visit Mason City to try to provide some guest posts for their blog to highlight just those things that we want visitors to see. Everyone has different highlights and you certainly caught my attention with Chief Sleepy Eye. What a great idea. I truly am impressed by the influence of North Iowa Bloggers in your region. Remember, I have those posts about Mason City if Visit Mason City is interested. I’m impressed, Beth Ann. What a great, and well-organized professional group you North Iowa Bloggers are. Congrats! Look forward to reading your post tomorrow on Visit Mason City. Sleepy Eye Stained Glass – on the south side of the main drag downtown. I know very little about Sleepy Eye, but we stopped at the store when we drove through a couple years ago. Very unique, owners at retirement age (and past), with no one to take over. Major supplier of stained glass supplies, does repair and new work. Neat place, interesting owners. Lots to look at and hear about. Kevin, I’m so glad you pointed this business out as, every time we drive through Sleepy Eye, I say, “We need to stop there sometime.” It sounds like we better make “sometime” soon. Randy took stained glass classes years ago and undertook several stained glass projects. So it’s something that interests him and that he enjoys. Except that he has not had time for this hobby in years and years. Glass and tools have been boxed for way too long. Perhaps time to respark his interest with a stop at Sleepy Eye Stained Glass. The statue of Linus ( of the Peanuts cartoon) in front of the public library. The Peanuts character Linus was inspired by Sleepy Eye native Linus Mauer. A fellow cartoonist and friend of Charles Schultz. Excellent, Brenda. Also drive right by that statue. Interesting post. First new thing I have learned today. I am always happy to enlighten my readers. Have a wonderful day, Missy. Audrey, I lived in Marshall as a child, the long-time hometown of my father’s family. I am sure I remember my grandmother mentioning Sleepy Eye. I hope it and Marshall are not turning into the prairie ghost towns that Almost Iowa mentions. We need our small towns. I hope not either. From what I’ve seen on my drive through Sleepy Eye along U.S. Highway 14, the town doesn’t appear to be turning into a ghost town. I doubt Marshall is either as it’s a regional hub. I live in Anadarko, OK, an area inhabited mostly by people of Native American descent. Your post on Sleepy Eye, MN appealed to me regarding the Native American background. Much of Oklahoma is rich in Native American culture, and a few of the tribes are finally beginning to develop interest in the tourism trade – especially those tribes of the SE part of the state. This community’s tourism interest has declined notably in the 25 years that I have lived here. But when people come to visit me, I give them the tour that I find interesting… drives in the rural areas noted for battles or settlement of a specific tribe, nearby rivers and places of interest – at least what I found fascinating and of interest as I educated myself about the area. When I show people the area I live in, it’s kind of like one of those Frommer’s “Irreverent” guides to a certain city… you get the lowdown, the highlights, the good, bad and ugly – the reality tour. I’m anxious to read more about Sleepy Eye when you find time to explore a little more! That’s the type of tour that I most appreciate–the reality tour, not some glossed version presented in a brochure or on a website, although I do value those also. Often, it’s tough for us to see what our own communities offer because we become so accustomed to seeing our towns that we can’t truly see them any more, if that makes sense. Thank you for your informative comment about your community and area of Oklahoma. You’re right. Walnut Grove is not all that far away with the Laura Ingalls Wilder sites and activities. 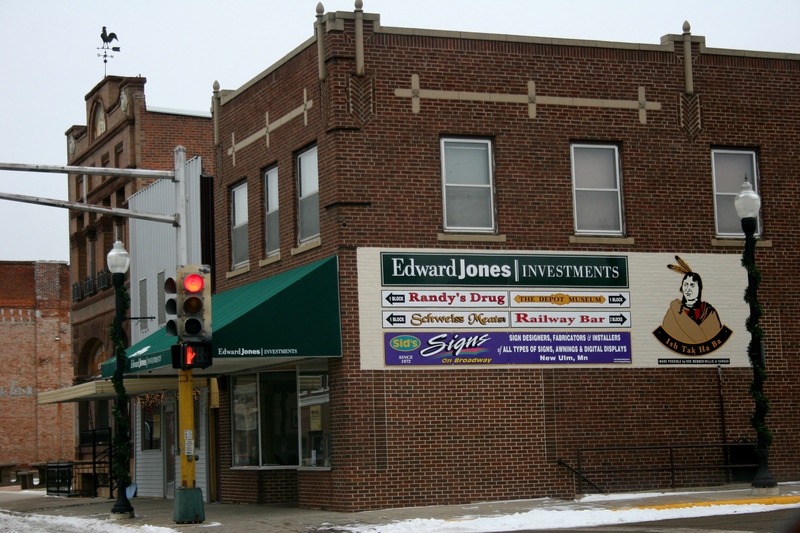 Nearby New Ulm has plenty to see with history, German influence and the wonderful Schell’s Brewery. The Sod House is near Sanborn. And, of course, Ft. Ridgely north of Sleepy Eye offers lots of U.S.-Dakota War history and nature. Thanks for the specific suggestions on things to see/do in the Sleepy Eye area. It’s been awhile since I’ve put my two cents in….. Hello…. Sleepy Eye Museum!!! ….. Sleepy Eye Historical Society puts together a Very Nice Museum if any one ever gets a chance to visit the town of Sleepy Eye, which mind you IS progress issuing and expanding in so many directions. Just recently we have expanded on our bike trail that stretches all the way around our entire lake. Our City, has made this bike trail far more people friendly and safer away from traffic on our major hwy and now even our fishing industry has even picked up due to this expansion. – “Way to go City of Sleepy Eye”- but I’m not here to praise them I’m here to say we have museums, original churches, historical homes, historical buildings, monuments & status spread throughout our town, we have landscapes and gardens of impressions, parks of numbers, a beautiful lake for fishing swimming & boating, any one person can find a whole weekend of activities to do right her in our cozy, humble, town of Sleepy Eye. Director of the Sleepy Eye Area Historical Society Museum. Thanks, Debbie, for updating us on all Sleepy Eye offers. Did you see my post of several months ago on Sleepy Eye Stained Glass? Now that’s definitely an attraction, too.